Sr Annette Cunliffe rsc, twice Congregational Leader of the Sisters of Charity of Australia, paid this tribute to her much-loved aunt, Sr Joan Jurd rsc, who died on February 15, 2018. Joan Lenore Jurd was born on the family property, Carwee, about 32 kms out of the town of Moree, on 19 August 1915, in the midst of World War I. Her mother Agnes May née Hickey had been a teacher, and her father, Ernest James Jurd owned and managed this sheep property. Joan was the third child and first daughter, her older brothers being Ernest Mervyn, known as Mervyn and Adrian Bertram, known as Bill. Two more brothers followed, Leslie John, known as John and Desmond Hurley – actually known as Desmond – and finally her sister was born: Julie May, my mother. Joan’s primary school education was undertaken at home supervised by a governess, who lived with the family. 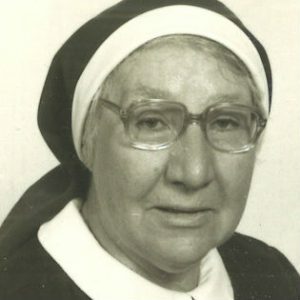 Her early secondary education was as a boarding student at the school conducted by the Sisters of Mercy at Gunnedah, while she boarded at St Vincent’s College, Potts Point for her final two years and, inspired by those who taught her, especially the wonderful Mother M. Peter Fennessy, she recognised her vocation to become a Sister of Charity. After completing her Leaving Certificate at the end of 1932, she entered the Sisters of Charity on the Feast of the Sacred Heart, on June 23, 1933 in the middle of the Depression. She was then received as a Novice, Sr M Perpetua, on January 13, 1934, taking her first vows in 1936 and her final vows on 20 January 1939 on the verge of World War II. Her beloved father had died suddenly during her Novitiate, but she firmly declined her brother’s efforts to induce her to return home because of this. 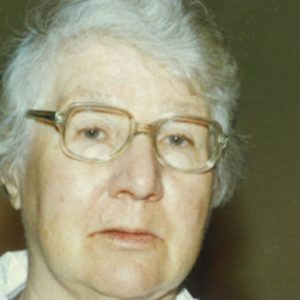 Those who were professed with her were Sisters Marion Corless, Michael Farrell, Clare O’Donaghoe, Dolores Hamilton, Paula Butler and Lidwina Hartmann, all of whom have preceded her to eternal life. She spent most of her remarkable 82 years as a professed Sister of Charity as an inspiring educator, building strong bonds of friendship and respect with her many students. She moved relatively few times, ministering at St Teresa’s Essendon, Victoria for four years, then in NSW at St Vincent’s College Potts Point during WWII and beyond before being appointed to Hurstville as Superior and Principal, returning to St Vincent’s Potts Point, as Principal for four years, including my last three as a student there. She was then appointed Superior of the community at Potts Point before returning to Hurstville, again with a dual leadership role which took a huge toll, resulting in several years of illness. Joan spent two years at Bethlehem Ashfield, then one year recuperating in the community at St Vincent’s Hospital, Lismore, assisting with clerical duties, before returning to teach at Hurstville, before retiring in early 1981. We remember Joan as an inspiring and passionate teacher, a lover of people especially little children, an authentic and down-to earth leader, and someone who naturally included all. Her insistence on good grammar and spelling and her love of literature and history have been passed down to generations of students and family members alike. She was loyal to friends and family, choosing to love rather than judge and she remained involved and alert to current happenings almost to the end. God was good in allowing her to retain her intellect and memory. Someone has remarked that Joan could die happy when Australia reclaimed the Ashes and the ALP regained power. At least one of those has come to pass. Her politics were based on a strong sense of social justice and part of her Vow of Service of the Poor that she lived in practice through hidden, practical assistance to people in need, wherever she encountered them. As one of my nephews remarked: May we all live lives as good and true as hers, and love as much, and be as loved. Joan, though your century plus surpasses even Bradman’s average batting score and we knew that you had to leave us some time, your passing leaves a huge hole in our lives but we know that your love of and interest in us all will continue forever. May God’s love enfold you now. Sr Joan Jurd was the second oldest Sister of Charity at her time of death. She was 102 years, 5 months and 27 days old. Joan was the longest-serving Sister of Charity at her time of death; she had been admitted for 84 years, 7 months and 23 days and from her profession date the period was 82 years 0 months and 26 days.